Nigel Farage, the leader of the U.K. Independence Party that just helped lead Great Britain to a disastrous vote to leave the European Union, is a man with a fondness for race-baiting rhetoric that will be quite familiar to Americans who've endured a year of the Donald Trump campaign. Like Trump, Farage blames crime and disease on immigrants and loves telling audiences that unemployment is a direct result of immigrants taking their jobs. He argues that Great Britain has "frankly become unrecognizable" and looks "like a foreign land." In one memorable interview, Farage complained about riding in a train through suburban London and hearing all the chatter in foreign languages on it. "It was a stopper going out and we stopped at London Bridge, New Cross, Hither Green. It was not until we got past Grove Park that I could hear English being audibly spoken in the carriage," he whined. 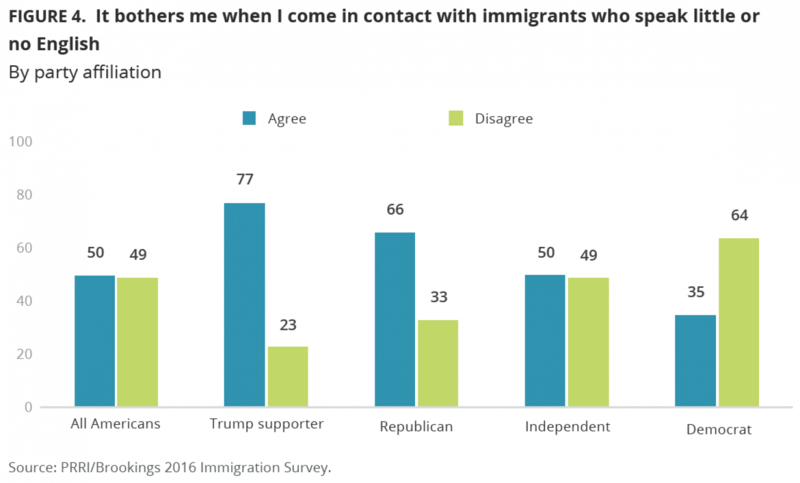 This anxiety about not being able to eavesdrop on other people because they aren't speaking English is a common trait among Trump supporters in the U.S., as well. A recent study from Public Religion Research Institute (PRRI) and the Brookings Institution demonstrates exactly how out of control the how-dare-they-speak-Spanish-near-me attitudes are in the Trump camp. The language issue is an important one because it's so fundamentally irrational. Many of the arguments against immigration — they are taking our jobs, they bring crime and disease — are untrue, but it's easy to see why people who believe these arguments might have cause to be afraid. If you really do think immigrants are taking your jobs or bringing diseases, the anxiety seems rational, if still distasteful. But the language thing betrays the anti-immigration forces. There's simply no rational argument for why it should matter to you if people you're sitting next to in public are having a conversation in a language you don't understand that doesn't include you. Sure, they could be talking about you — though what a narcissist you must be to assume that — but that's also true of people sitting across a room that are speaking in volumes you can't hear. It's anxiety unmoored from any rational justification, however tenuous. It's hate for its own sake, fury that people dare to be different than you without apologizing for it. In both the U.S. and the U.K., a lot of digital ink is being spilled analyzing the rise of right wing anti-immigrant populism. There are two general arguments over its cause. One is the economic argument: Our changing economy, coupled with the damage done by free trade and declining government investments in infrastructure and social services, causes skyrocketing economic anxiety, especially in areas outside of urban centers. This, in turn, causes people to look for villains to blame, and they settle on blaming immigrants, people of color, and liberal urban "elites". The other is a culture war argument: The right wing populists are petty, resentful people who dislike change, and their hatred of immigrants, feminists, and urbane people generally is neither complex nor particularly tied to economic insecurity. They're just small-minded and ugly to anyone that isn't like them. This is an admittedly over-simplified take on the issue. Most people — I count myself amongst them — who closely follow the rise of right-wing populism would argue that it's some combination of these two factors. It would be foolish to pretend that racist white people are okay with darker-skinned people sharing in the bounty if the economy were more robust. But it's also foolish to deny that it becomes much easier for a racist to feel justified in blaming the immigrants for all their problems if the quality of local social services is in decline. Still, it matters how much this kind of right-wing populism is due to cultural resentments vs. economic anxieties. Many on the left see the high levels of opposition to free trade among Trump supporters or Leave voters and optimistically conclude that this provides a way to ameliorate their ugliness and hate. If their nastiness really is a reaction to economic anxiety, after all, there are options here. Perhaps they can be educated about a more liberal path towards their economic goals. Perhaps a return to more robust social spending or more restrictive trade policies will help restore economic health to their communities, reducing their anger and hatred. But if this kind of right-wing populism is rooted in hate, and the economic stuff is just slathered on top, then it makes it much harder to conceive of a solution to this problem. If people hate immigrants and urban "elites" not because they are reacting poorly to economic insecurity, but just because they really don't like difference, there's not much you can do about that. Unfortunately, there's a significant amount of evidence that right-wing populism is rooted more in plain old small-minded bigotry than it is a form of economic anxiety that simply expresses itself in nationalist, bigoted terms. In Great Britain, voters were continually warned that a vote for Leave was a vote for economic devastation. Yes, a lot of people rationalized that away, accusing the Remain folks of fear-mongering. But people who are truly worried about their economic status would probably hesitate more to gamble with the future this way. Instead, you had Farage saying things like he would happily give up economic growth in exchange for less immigration. While there was no exit polling, the widespread belief is that Leave folks skew older and are more likely to be retired, just like right-wing populists in the U.S. The decline of the pound has got to be hitting people on a fixed income hard. So, this is a fairly ugly example of people choosing to screw themselves over economically rather than accept cultural change. One of the strongest predictors of whether an area of England voted Leave was how few immigrants actually live there, bolstering the sense that this is largely about culturally isolated people lashing out at abstract fears about the unknown foreign Other. In the U.S., there's similarly troubling evidence that right-wing populism might be more about base bigotry than economic insecurity, starting with the fact that the rise of Trump coincided with an improving economy and dropping unemployment. The assumption that Trump is mainly appealing to economically unstable white people appears to be more driven by urban journalists mistaking the cargo shorts-and-baseball-caps aesthetic of his followers for actual working class status. In reality, as Nate Silver at FiveThirtyEight showed, "As compared with most Americans, Trump’s voters are better off." Not by a small amount, either. The average Trump household draws a median income of $72,000, which is $16,000 more a year than the average American household. Both Clinton and Sanders supporters have a median household income of $61,000. None of this means that liberals should abandon the cause of economic justice, better trade regulation, stronger unions, or more robust social spending. These things are good in and of themselves, and help stabilize the economy and the lives of people across the demographic and political spectrum. But we should let go of the hope that liberal economic policies will do much to end nationalism and racism. God knows American red states, which keep electing Republicans who impose austerity measures so serious that it's causing their governments and school systems to collapse, proves the point. A lot of right-wingers would rather burn their own homes to the ground rather than share them fairly with people of color. I wish I had an answer to that problem, but if the threat of economic devastation doesn't change their minds, apparently nothing will.